Yesterday I was watching the starting 15-20 minutes of the iPad and iPhone launch. Both were revolutionary products at the time of their launch. But how was it launched by Steve?How will you sell a new idea or concept to people? We will learn from how Steve started and structured his talk. Steve jobs built audience expectation right at the start. He uses words like 'revolutionary technology' and raises their hope. If you are selling a new concept or idea, you might want to start with raising the hopes of the audience. Choose your words carefully and tell the audience about awesome this thing is. The audience must be told that you are really onto something new and interesting. If you will not tell, who will? Steve Jobs had a child-like excitement about his products. Listen to this from his talks. He says, "It is so wonderful" when he talks about 50 million visitors to 284 Apple stores. "I don't even believe that" after he shared last quarter revenues of $15.6 billion. "It is unbelievably great" says Steve about the iPad. Be positive and talk good about your idea / product. You need to let your inner child come out and talk openly and honestly. 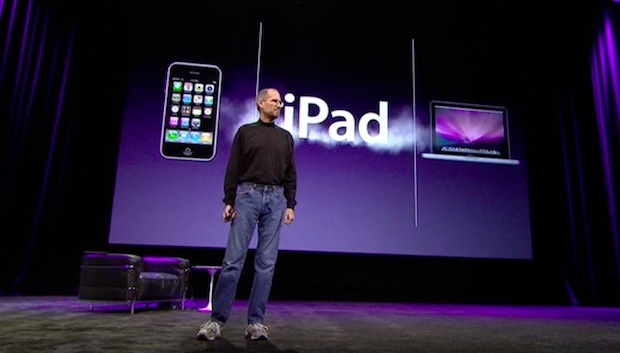 Steve does not start by showing you the product - iPad or iPhone. When you are selling something novel, it needs a context. What is happening around us? What are the problems? What is the novel approach? For iPad, he talks about a need for a third device between a phone and a laptop. But if such a device is launched, it has to do many things well. Gaming, Emails, Browsing, Multimedia, etc. Then he talks about Notebooks and how they are just a mini-laptop. Finally he launches the iPad. The same approach was taken for iPhone. What kind of smartphones exist today. They are hard to use and not very smart. We want to launch something 'very very smart' and very easy to use. Steve has sold us the very need why a new product is required. Only then, does he tell us he is launching a new phone; the iPhone. Tell people why they need your new idea. Only then can you really sell the idea.